For today’s prompt, I narrowed it down to three finalists: the Native Foods Cookbook, pretty much anything by Bryant Terry, or the vintage (1958!) Polish cookbook that I found in Portland last year. Every one of them was a contender for solid reasons. I am an oddity in modern American society – fourth-generation born in the U.S., but I can only claim one national heritage: Polish. Therefore, you can imagine how much fun I’ve been having veganizing recipes from Polish Cookery; I wouldn’t be surprised if my grandmother cooked from that book. 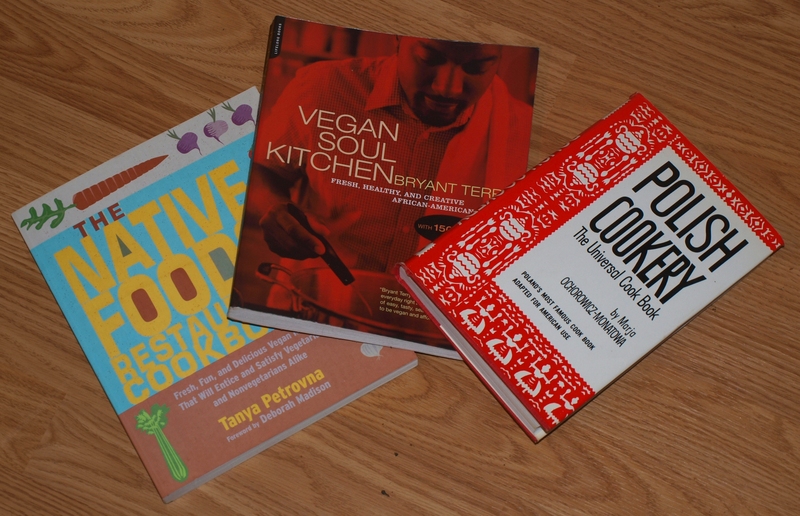 On the other hand, Bryant Terry’s recipes are astounding – creative, down home cooking for a modern vegan world. Not at all the heritage I grew up with, but an amazing world of food I’ve come to love as an adult. In the end, I decided to cook from the Native Foods Cookbook, if for no other reason than I’ve been obsessively cooking from this book since we got it a few months ago, and every single meal has been phenomenal. There are so many fantastic recipes in this book: nacho gazpacho, one of the best taco salads I’ve ever eaten, nuggets, steak, goulash, tacos, and tonight’s feature, the puff pastry pot pie. 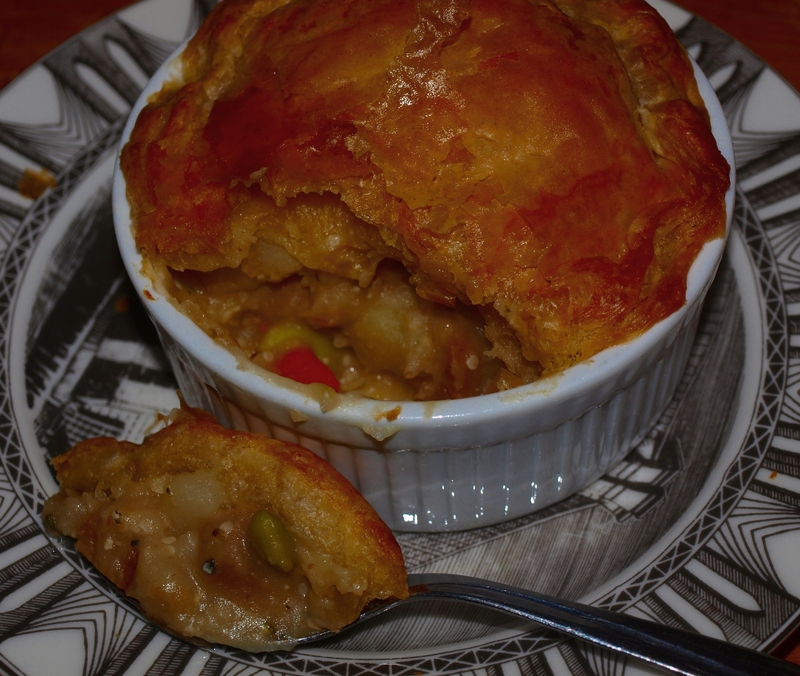 I’ve always loved pot pies; so delicious, so comforting. Also, I’ve always been a fan of having all of my foods mixed together in one dish…casseroles, hashes, pot pies…I love them all! 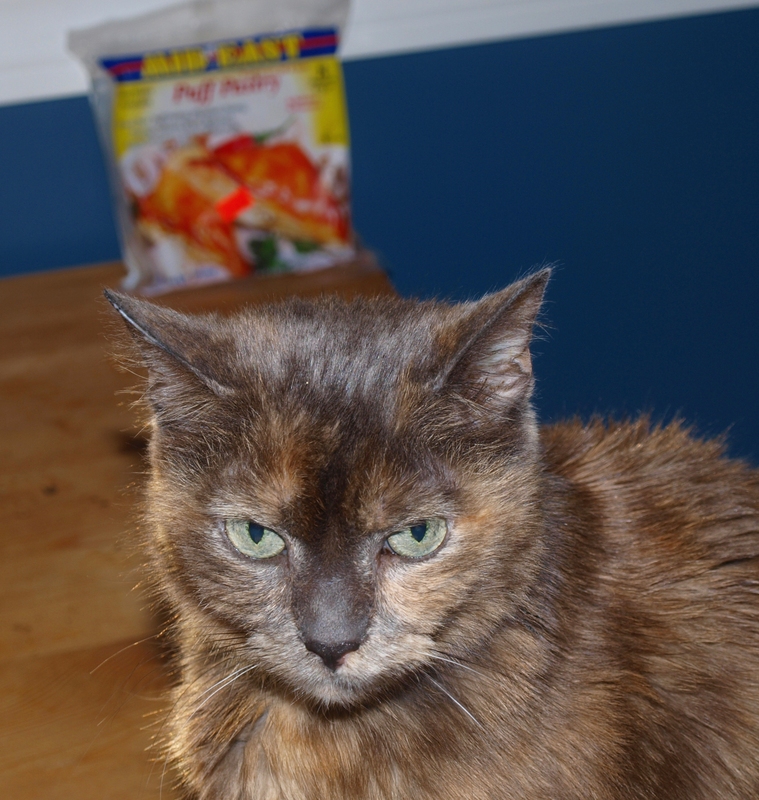 Hazel is clearly not amused by the fact that I am using *her* table as a photo studio. Vegan AND palm oil-free. Take that, Pepperidge Farms! The recipe starts with some lightly boiled vegetables, then you saute some onions (I substituted elephant garlic) and flour, add some milk, and then the vegetables and their cooking water and some seitan (I used Upton’s). Plop that mess into an oven safe dish, cover it with puff pastry, and bake. That’s all there is to it! We love cute, little food, so I baked these in individual portion sized ramekins. The recipe actually made twice as much filling as I could stuff into the six ramekins we own, so I froze the other half so we could do this again soon! They came out of the oven all golden brown and oozing over the sides. I poked some vent holes in the tops, but apparently it wasn’t quite enough to let all of the pressure escape. I don’t even care, look at how beautiful they are! 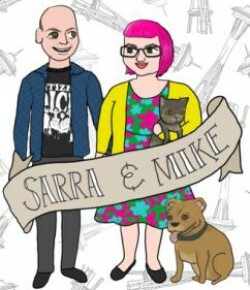 Seriously, look at these things! 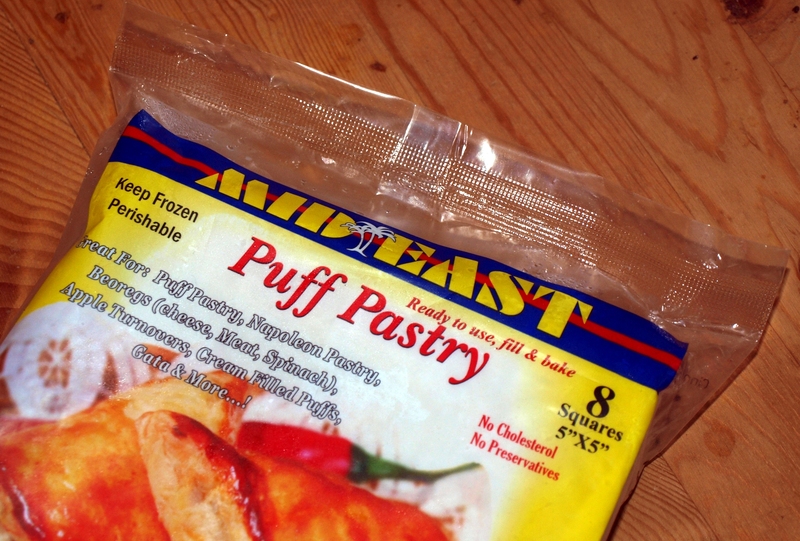 Remove puff pastry from the freezer and allow it to defrost for about 20 minutes so that it’s workable. In a saucepan, put carrot, celery, edamame, potatoes, water, and salt, and bring to a boil. Reduce heat and simmer about 10 minutes, until the potatoes are soft. Heat oil in another saucepan, and saute onion until transparent and lightly browned. Sprinkle with flour and stir until flour is slightly browned and mixture has thickened. Add soy milk and stir to blend; then add seitan, hemp seeds, and simmered veggie mixture. Heat until thickened. Preheat oven to 400 degrees. Lightly roll out puff pastry sheet on a lightly floured surface. Cut into six rounds the size of the bowls you are serving in. Bake on an ungreased cookie sheet for about 15 minutes. Portion warmed seitan-veggie mixture into serving bowls and top each with a puff pastry round. The recipe comes with a variation, which is the way I did it: using ovenproof bowls, place the filling into the bowl and top with uncooked puff pastry rounds. Then bake the whole thing together. 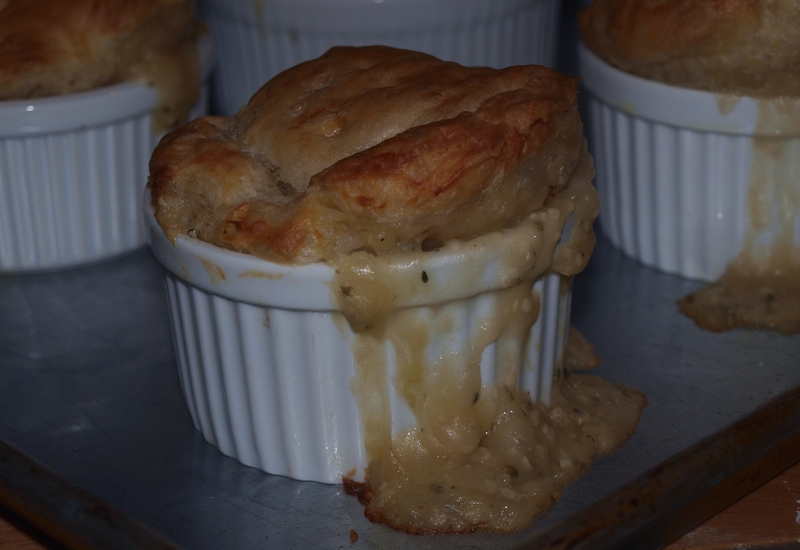 I also punched some holes in the puff pastry to allow steam to escape, but the photos above prove it wasn’t enough. I also didn’t roll out the dough, since there was plenty to cover all of the bowls without trying to stretch it out. These were so, so good, and not all that difficult to make. That’s why the Native Foods Restaurant Cookbook gets my nod for my favorite cookbook…this week, at least. “…this week, at least.” Ha! So true. I love how your voice and personality shine through in your posts! Total heart eyes over here. such fancy little creations!!! I don’t even own any ramekins. They look so fun and elegant. Also, that’s pretty cool that you are 100% Polish. I’m just an all-purpose blend of western european and UK. 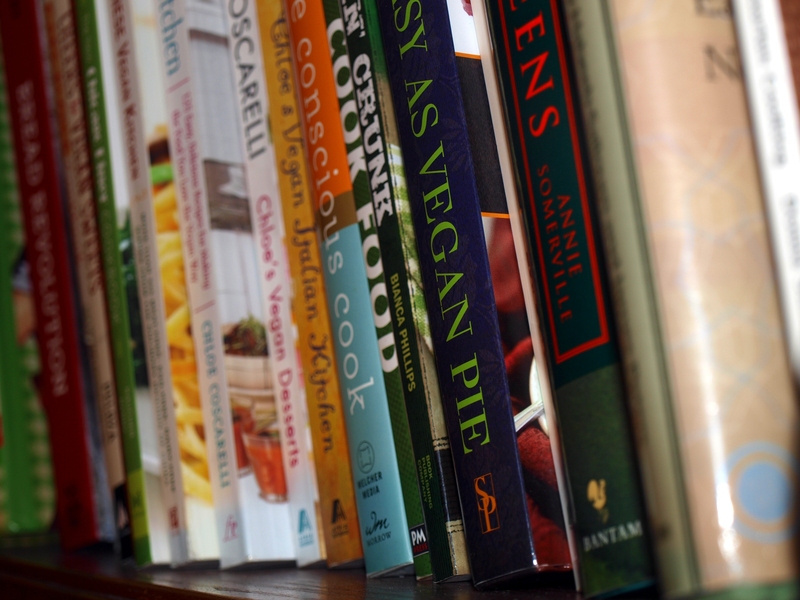 I also have bajillions of cookbooks and love them all – but I DON”T have the Native Foods book — so it’s great to read your rave review! I don’t own this book or any of Bryant Terry’s. I’m really enjoying this prompt seeing everyone’s recommendations and adding things to my Christmas and birthday wish lists. That supermarket sounds ace! It’s reminding me a Turkish supermarket that I used to live near, it had a whole aisle just for olives! We love little markets of all stripes, especially if they have a specialty! I can’t say enough good things about Bryant Terry’s books. We don’t cook out of them as much as we’d like because his recipes tend to be rather complicated. If you’re willing to do the work, though, the rewards are tremendous! I haven’t heard of this cookbook yet, but oh man that looks good! Yum! So cute. 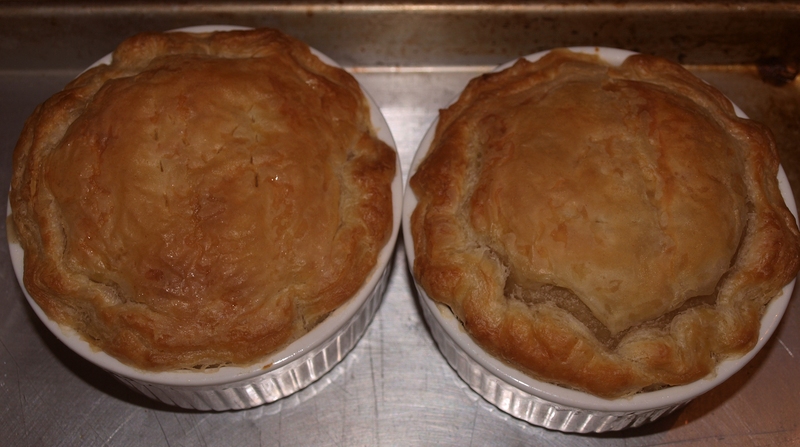 I haven’t made pot pies in forever…I’m getting inspired and already dreaming about a vegan Thanksgiving!